The recently automated impounding station controls the water level in the docks using the original Worthington Simpson pumps driven by Lancashire dynamo. The Impounding Station was built in 1929 and is used to regulate water levels between the West India and Millwall Docks. 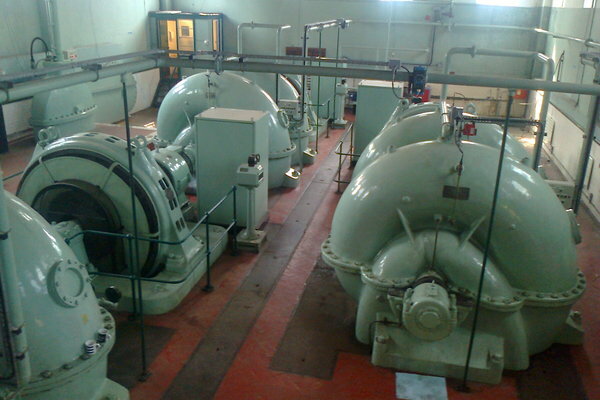 The impounding station is the only source of water to West India Docks, outside the tidal run in, and it is in daily use. The Impounding Station is home to three pumps which provide the means for taking water from the River Thames and pumping it into the dock. The pumps are still the original ones installed 85 years ago and are capable of pumping up to 9 cubic metres of water per second. As an illustration of the rate at which the pumps operate, they would fill an Olympic size swimming pool in 9 minutes, and pumps around 4 million tonnes of water each year. The intake pipes draw water from a sump beneath the Impounding Station B uilding. The outfall pipes pass beneath Marsh Wall Road and their discharge is submerged within the Dock. Trash screens operate whenever the pump is running to protect the pump from debris entering from the river. Debris is discharged into a conveyor belt that empties into a skip. The Canal & River Trust has carried out automation and repairs to the pumps in the Impounding Station in Docklands over the last 12 months. This enables the pump to be operated remotely, although local operation can also be carried out.